Homeschooling parents can pique their kids’ interests by incorporating educational information right into the decor. One of the easiest ways to do this is to make use of the large block of space that is your shower curtain. The easiest-to-find educational shower curtain is the world map. 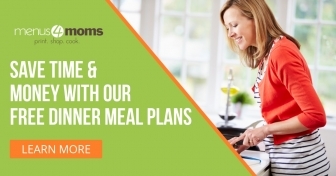 These are commonly available at discount department stores. Our current world map shower curtain came from Target, but you can frequently find a similar world map shower curtain at Walmart, JC Penney, or Amazon. Urban Outfitters offers a North American map. You may also be able to find a shower curtain map of your state with a little web searching. 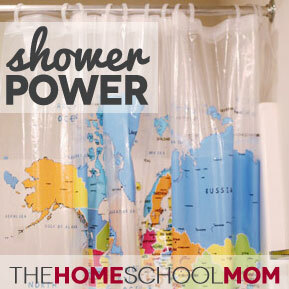 Laura Grace Weldon, who also blogs for TheHomeSchoolMom, doesn’t seem to find that the passive learning offered by shower curtains worked that well in her house, and she has another great idea for getting people to engage with the map she hung at her house. But I actually have heard from a lot of families that their shower curtains really work to set an educational agenda or become a cue for memory work that kids themselves initiate and enjoy. When we had young children we even used a second world map shower curtain as a table cover for our kitchen table, which stimulated a lot of conversation, and, since it was vinyl, wiped clean easily, too. Uncommon Goods has a shower curtain that depicts the water cycle. ThinkGeek has one with the periodic table of elements. If you’re looking for foreign language, you can find German, Spanish, or French vocabulary at Overstock.com, which also has a shower curtain featuring 500 SAT words and their definitions. Math SAT concepts including slope, probability, and positive and negative numbers are available on a shower curtain from TILCO. Those who are trying to learn about the hip bone connecting to the thigh bone might want the skeleton shower curtain, available from Amazon. You can also find alphabet, dinosaur, and metamorphosis shower curtains designed with the younger child in mind. A speaker at homeschooling conferences, Jeanne says one of her most popular talks is called “Let Your House Do the Homeschooling,” about setting up your house for both passive learning and an active homeschooling family. Jeanne also does portfolio evaluations for homeschoolers in Virginia. Jeanne teaches writing and literature for her youngest son’s homeschool co-op, and she is a student of how learning works – at home, in the music room, in small groups, in the college classroom, on the soccer field, and in the car to and from practice. Read more by Jeanne on TheHomeschoolMom.com and at her blog, At Each Turn. Hanging a world map and U. S. map on our walls has been such a boon for our geography. Our children have learned effortlessly by staring at the walls. We also have an alphabet around the top of our walls that’s been valuable for the little ones.